Kansha Preschool extends its heartfelt thank you to The Flatbread Co. in Paia for hosting our very successful Benefit Night on Nov. 18. We also wish to express our kansha (deep gratitude) to our silent auction bidders and winners, donation box contributors, and to the following for their generous contributions to our silent auction: Tokyo Tei, Na Hoaloha Ekolu (Old Lahaina Luau), the Fairmont Kea Lani (Ko Restaurant), Ka’anapali Golf Courses, TJ’s Warehouse Outlet, Maui Coffee Roasters, the Grand Wailea (Humuhumunukunukuapua’a Restaurant), Alik’s Automotive Repair, Maui Soap Co., Tiffany Chou, Divine Beauty Inspirations, Alive & Well and Warren S. Unemori Engineering, Inc. Thank you all for caring for our children and providing a solid foundation for our future! It is with much aloha that we acknowledge Hawaiian Airlines and wish them a happy 85th anniversary of service in our community. 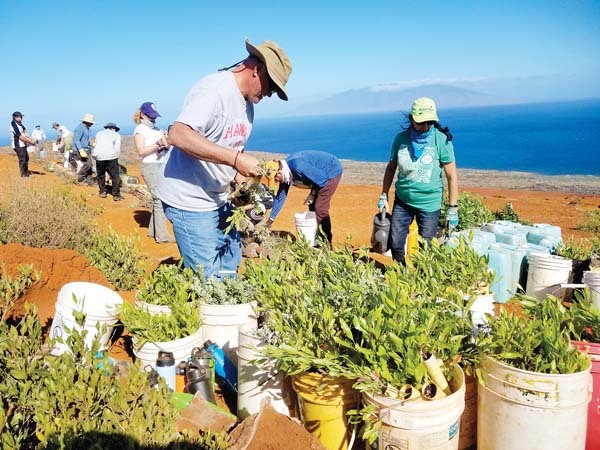 On Nov. 15, Hawaiian Airlines employees and their families gave their morning to The Maui Farm, hand weeding and cleaning the windbreak area of our 2-acre educational farm. Volunteers cleaned sugar cane and banana patches; cleared invasive grasses from fence line; planted ti leaf, edible and ornamental ground covers; and helped to work the compost piles while clearing and stripping numerous cut tree branches. The morning project was of huge benefit to The Maui Farm, and allowed us to accomplish in one morning what would have taken a few weeks to do ourselves. The project made room to grow more food for the families we serve, to improve the health of existing plantings and to help with consistent maintenance needs. On behalf of The Maui Farm’s board of directors, staff, volunteers and the community members we serve, we extend our warmest mahalo nui loa to our friends at Hawaiian Airlines. Thank you Whole Foods for donating sandwiches, apples and water to our band and cheerleaders during the Maui Fair Parade. We appreciate all your support and donations. Last Sunday evening (Nov. 9), my husband and I had our car break down off Peahi Road in Haiku. We were two Australians stuck on the side of a quiet street, and it was getting dark. We were touched by the kindness of a lovely lady, a complete stranger, who assisted us by bringing us water, trying to call the car rental company and driving us back to Paia. Unfortunately we did not get this kind lady’s name – but we wanted to thank her again for her generosity, kindness and going out of her way to help us. Her assistance and kindness demonstrated the true “aloha spirit,” which we experienced on Maui, and we are forever grateful. The Department of Health is in its eighth year of providing free flu vaccinations to schoolchildren and school staff. As the clinic manager for the St. Anthony Grade School and Junior/Senior High School flu clinic held Nov. 18, a big thank-you to Winona Martinez and Patricia Rickard, Art Fillizar and Samantha Gomes for helping to coordinate the students and staff of the schools in making the clinic run safely and efficiently. Special thanks to parent volunteers Nora Guerrero, Simona Patieno, Anna Foust and Cheyanne Kaawa for helping to monitor the students after they received their vaccine. And thank you to Heidi Taogoshi, public health nurse, who supervised the vaccinators at the clinic and organized the clinic operations. Mahalo to everyone involved in creating the first Made in Maui County Festival. The care and concern that were given to me to help present my art and fashions, Couture of Maui, were very positive. I am very grateful to our dear Mayor Alan Arakawa, who – to my big surprise – chose my booth as the winner of his booth contest! As a cancer survivor I almost lost it all. Now, rising out of the hard times and receiving the tremendous support and belief in our ability to share a quality fashion show in such a small amount of time, I feel like I am able to start my art and business all over again. I want to name names of the ones in the Mayor’s Office of Economic Development, but I am afraid I may leave out someone. . . . So thank you all, and to all the other vendors who worked so long and showed up in flying colors. Maui rocks! Let us demonstrate to our Lord our desire to walk faithfully with the Holy Spirit. Our devoted friends of the United Methodist Church have shared their prayers and malama (care) for the inmates of the Maui Community Correctional Center. Thank you Esther Bertram and UMC Ministry for the 2014 donation of $25. Your kind donation is for the glory of the Lord, for all will journey in new joy and faith. Hale Makua Health Services would like to thank Bank of Hawaii for its $5,000 Mike Lyons Community Award, First Hawaiian Bank Foundation for its $25,000 grant, the G.N. Wilcox Trust for its $15,000 grant and the McInerney Foundation for its $25,000 grant. These gifts have made possible the launch of our electronic medical record system Oct. 1. The Patient Protection and Affordable Care Act federally mandated electronic health records for hospitals and private physician practices by 2014. While Medicare and Medicaid EHR incentive programs provide incentive payments to eligible professionals and hospitals, nursing homes and home health care agencies like ours are not eligible. We need to move in the same direction as hospitals and physicians with regard to digital medical records, so we are very grateful for the generous support of so many community foundations and organizations. These grants will help improve overall quality of patient care by allowing us to document patient information more efficiently and effectively while allowing ease of access to primary care physicians and other health care providers involved in patient care. The EMR will streamline communication and improve continuity of care for patients who utilize our long-term care, home health, adult day health and rehab programs. Women Helping Women would like to offer our sincerest and heartfelt thanks to all of the volunteers and community members who helped make our sixth annual Fun Run a success! Your donations of door prizes, snacks, talents and time meant the world to us, and we truly appreciate all of you! We’d like to thank Rudy Huber, Soroptimist International of Maui (Cathy Shimizu and crew), the Kiwanis Club of Maui (Greg Peros and crew), Mahina Martin, Gwen Hiraga of Munekiyo & Hiraga Inc., Sgt. Mary-Lee Sagawinit of the Maui Police Department, DJ Zeke Kalua, the crew from Keoni’s Hot Lava Dance Fit Studio, and the board of directors and staff of Women Helping Women. I would like to thank the person who found my watch. I lost it while shopping at Costco on Oct. 6. I didn’t know if I lost it in the store or in the parking lot, but I never expected to see it again. The watch doesn’t have much of a monetary value but does have a sentimental value. The Na Hoaloha Board of Directors and staff thank students from the Maui High School Health Occupational Students of America and the Maui 4-H Club members for helping raise money to support programs to help frail seniors. Na Hoaloha recruits and trains volunteers to help homebound seniors live independently and to stay in their homes. Na Hoaloha is developing intergenerational programs and those efforts are coordinated by Na Hoaloha’s first Intergenerational MHS student Gaizel Sarmiento. We are grateful and proud of these dedicated youth.